A century ago, eager theatergoers packed into the Schubert Theater to enjoy Victor Herbert's tuneful operetta Eileen. Last night another generation of theatergoers packed into Christ and St. Stephens church to enjoy a reincarnation of this enchanting work, thanks to Alyce Mott and the Victor Herbert Renaissance Project Live! What we saw and enjoyed last night is not exactly what the 1917 audience saw. Alyce Mott has made a name for herself by reworking Herbert's oeuvre to improve upon and enhance the relevancy of the stories. In this case Henry Blossom's original libretto was rewritten, whilst preserving every note of the original score, which was compiled by the late Dino Anagnost. The 1917 audience relished relief from the threat of war hanging over their heads. Hmmm! Plus ca change, plus c'est la meme chose! VHRPL! has been growing by leaps and bounds. This is only their third season and nine of Herbert's operettas have already been performed, to the delight of an ever-growing audience. This was the first time a show was presented with the New Victor Herbert Orchestra and it certainly added a great deal. The story takes place at the end of the 18th c. and concerns the Irish quest for freedom from Great Britain. Lady Maude's late husband was unsympathetic to the cause and also toward her niece Eileen who was shipped off to a convent in France where she has fallen in love with "a fine Irish rebel" named Barry O'Day. Lady Maude lives in Castle Sligo which was seized, along with its land, by her husband Lord Estabrooke, in the name of the British King. Lady Maude Estabrooke is sympathetic to the Irish cause and would be happy to relinquish the land as long as she can live in the castle. The charming Barry is irresistible to women, apparently! Of course there are obstacles. The local British authority Colonel Lester is out to get Mr. O'Day, and Mr. O'Day's "best friend" Sean Regan plans to betray him as well. Of course, there needs to be a happy ending so, not to worry, the guy gets the girl and escapes from the clutches of Lester in a ruse involving false identities and a pawn named Sir Reginald Stribling, In point of fact Stribling is a British Knight, but he is used as a pawn. As one would expect there are songs both romantic and patriotic, and they were performed with verve and enthusiasm. Some of the ensemble have been there from the start, notably David Seatter who performed the role of Sir Reginald with humor and panache. Others are enjoying their first season with VHRPL! and have already established a fine ensemble feeling. 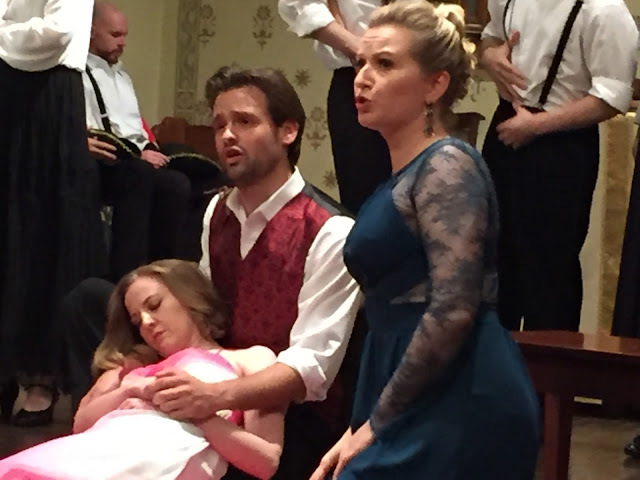 Soprano Joanie Brittingham, well remembered from Chelsea Opera, appeared in the title role and delighted us with her "Reveries" and harmonized beautifully with tenor Tom Carle who performed the role of Barry O'Day. Their duet "Thine Alone" was a surefire hit. Mr. Carle's solo "When Shall I Again See Ireland" was sung with deep feeling. We particularly loved "The Irish Have a Great Day Tonight". Tanya Roberts created the character of Lady Maude who faced life with grace and good will. Her acting was impeccable but we missed some words here and there. Fortunately, there was a libretto to fill in the gaps. Jovani McCleary played the traitorous Sean Regan who led his men in a rousing "Free Trade and a Misty Moon", the lyrics of which reminded us of W.S. Gilbert's clever wordplay. Although he was the bad guy, his wonderful singing and acting made us like him very very much. Another artist we liked very very much was newcomer Christopher Robin Sapp who took the role of Dinny and deserved the big hand he got for "She's Sweet as Any Flower". Coloratura soprano Haley Marie Vick had a lovely number as well--"Too Re Loo Re" and filled it out with winsome embellishments. Colonel Lester was portrayed by the excellent Richard Holmes who we have enjoyed on countless occasions with the New York Gilbert and Sullivan Players. His duet with Ms. Roberts "Life is but a Game" had them sparring but, well, you know, love conquers all. Ms. Mott's direction was effective and moved the action right along, augmented by Emily Cornelius' fine choreography. Music Director Michael Thomas conducted the chamber orchestra comprising Philip Wharton (violin), Scott Ballantyne (cello), Judy Sugarman (bass), Sheryl Henze (flute/piccolo) and William Hicks (piano). Significantly, the music was not given a new arrangement. Parts were assigned as they were a hundred years ago, with the piano playing remaining parts. The fourth season has already been planned and available on www.vhrplive.org. However, one needn't wait until next November because something special is happening at Opera America on June 6th--vocal excerpts from Herbert's Nahoma along with revelations about the politics of American Grand Opera. Plenty of intrigue occurred between Oscar Hammerstein and the Metropolitan Opera. Listen and learn! Sounds like our cuppa!